Fried potatoes, boiled potatoes, mashed potatoes, chips and oven bakes. Potatoes are versatile and full of goodness. Everyone loves a potato side with their meals. 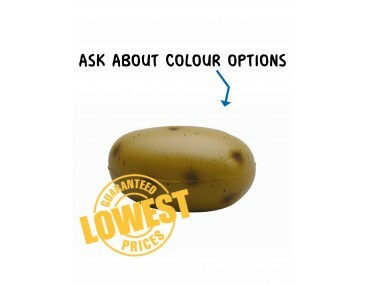 Now you can give you clients a fun potato to keep on their desks, at home, in the car or in their laptop bags. This potato has the special advantage of being a stress toy, making it fun and frivolous while advertising your company brand at the same time. When the going gets tough and your frustration levels are soaring towards dangerous, take out your little stress potato. Bash it and smash it, squeeze it and squish it. It will always return to its original shape. For other carbohydrate themed stress balls, consider promotional stress ball bread. Stress toys are great for your health, well-being and peace of mind. Our potato looks totally authentic with little dark indented dimples on the skin and an elongated oval shape. Add a different side to your company image when you brand these potatoes with your logo and graphics. Hand them out to clients and potential clients at expos, product launches, trade shows and corporate events. Fruit and vegetable stores, fresh produce markets, farming enterprises and businesses in the food sector can make great use of these trendy toys. Speak to us about branding, our listed price includes branding of your logo or graphic in a single colour print. Prices exclude GST and branding set up of $60. We offer a product turnaround time of two weeks, but we can offer even faster turnaround times for urgent orders. This product is supplied in bulk quantities. Please note that our prices exclude GST and a print set up of $75 applies.